There's no better way to get through the weekday grind, than anticipating a new adventure that will get your adrenaline pumping. If you like new experiences like we do, then you need to check out Cloud 9 Living for tons of out-of-the-box adventures that you probably didn't even know you wanted try. 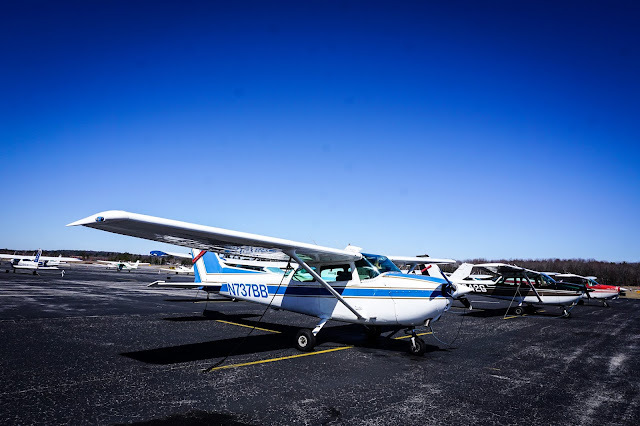 We immediately were drawn to the list of flying experiences on Cloud 9 Living. In particular, learning to fly has been on Matt's bucket list for quite some time. But little did we ever consider spending one Saturday afternoon in New Hampshire doing just that. The Learn to Fly experience immediately jumped off the page for us and without hesitation we signed up! 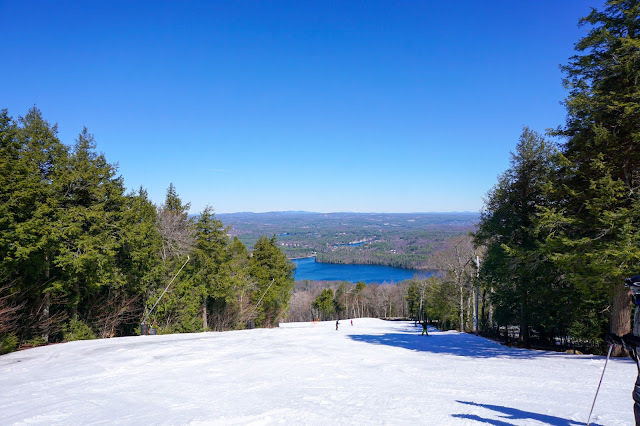 Last weekend we visited Wachusett Mountain for some spring skiing. The weather couldn’t have fit the description any better, as it was around 55 degrees under blue skies. Wachusett is located only an hour from Boston, in Princeton, MA. 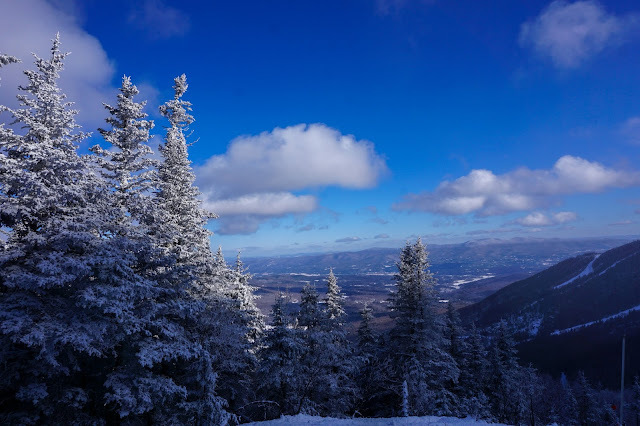 While it is only half the distance of the closest mountains in New Hampshire, it still features skiing and conditions that are compete with those bigger mountains. Wachusett has a great balance of terrain, featuring many intermediate hills, but with a few experttrials and ample learning terrain. Additionally, nearly the whole mountain is available to ski under the lights. Although the ski season may be winding down across New England, Wachusett has some exciting enhancement for the next ski season. Through investment in a new water pump system and snow making equipment, these new advancements will allow them to quadruple their snow making capabilities next season—and Wachusett was already regarded across New England for their excellent snow making. This past weekend we headed back to North Conway for a skiing and hiking adventure. We stayed with the White Mountain Hotel & Resort, which is located just a few minutes off the main road of North Conway. 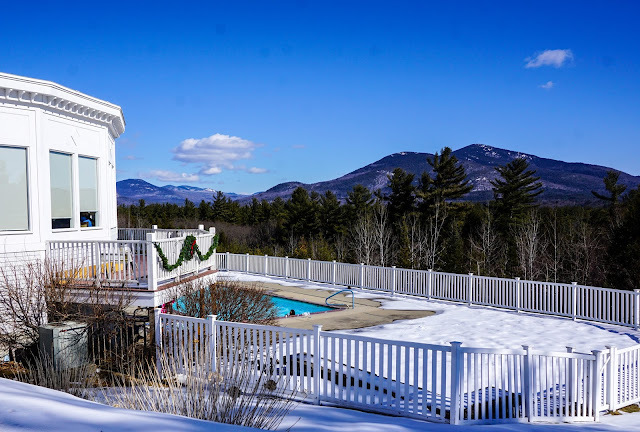 This gives the property a very private resort type of feel, featuring fantastic views of the surrounding White Mountains and Cranmore Ski Area. The resort also provides guests with a full stack of amenities, including a heated pool, jacuzzi, fitness center and game room. It is also situated on Hales Location Golf Course. Our favorite amenity during our visit was the dining area and tavern. The hotel offers guests a complimentary breakfast—and not the typical continental style serve-yourself-buffet, instead a full service hot breakfast off a menu. In addition to having a great property, views, and service, the White Mountain Hotel did all the little things that go a long way with guests while maintaining an affordable price. When we visited Stowe back in early December, Winter was just underway. We had such a good time and there was so much that the town had to offer, that we couldn’t help but make another trip at the end of the winter. For starters, we were excited to head back to Stowe Mountain now that nearly the whole resort was open. Despite some rain during the week, the skiing overall was fantastic. The weather featured bluebird skies and temperatures hovering right around freezing. Stowe’s snowmaking and grooming team has done a fantastic job keeping the mountain in mid-season condition. The skiing was especially good at the Spruce Peak side of the mountain. We enjoyed skiing Upper Smugglers and Ridge Run. There were even some good powder stashes in the Ridge Glades. We also made it over to the Mt. Mansfield side of the mountain for a number of runs, where the trails off the Hackett’s Highway chair skied especially well. Subscribe to Travel The East!